Rock exposure map of Antarctica. Outcrops shown in red were derived using the new methodology from Landsat 8 data, and outcrops in blue were derived from the existing Antarctic Digital Database (ADD) rock outcrop dataset to supplement areas south of 82°40’ S (not covered by Landsat 8) or islands lacking suitable cloud free images. (Rock exposure exaggerated for illustration purposes.) Image credit: Burton-Johnson et al. Dec 17, 2015 • Alex Burton-Johnson, Martin Black, and Peter Fretwell from the British Antarctic Survey have used Landsat 8 data to create a new rock outcrop map for Antarctica, which will become part of the Antarctic Digital Database. The team presented their research at #AGU15 today. Lead author Burton-Johnson was away conducting fieldwork in Antarctica, so we spoke with co-author Marin Black about their work. Differentiating rock outcrop from snow and ice is a particular problem in the Antarctic—extensive cloud clover along with widespread shaded areas due to low solar elevation angles and extreme topography causes difficulty in accurately delineating rock extent. Commonly used techniques, such as the Normalised Difference Snow Index (NDSI) do not perform well in the Antarctic due to misclassification of areas of shade and cloud cover. We used Landsat 8’s multispectral data, including thermal bands, which allowed us to generate a new automated methodology for delineation of rock outcrop in Antarctica, overcoming the limitations of previous techniques and generating a new rock outcrop dataset with higher accuracies than previously achieved. We found exposed rock forms 0.18% of the total land area of Antarctica, half of previous estimates. In order to produce a rock outcrop map for the entire Antarctic continent, we required a freely available georeferenced multispectral dataset. The dataset needed to cover the high latitudes; be recently acquired; be of a high enough resolution to identify individual outcrops and geomorphological features; and have suitable coverage of the continent. On this basis, the Landsat 8 multispectral satellite data was chosen for analysis as no other platform met these requirements. It would not have been possible, or at least would have been prohibitively expensive, to carry out this study without Landsat data. What benefits did Landsat 8 data offer? Our requirements for the data we needed led us to primarily use Landsat 8, as we needed recently acquired multispectral imagery for the whole continent. Landsat 8’s multispectral and thermal bands allowed for the generation of a new automated methodology for extracting rock extent in the Antarctic. 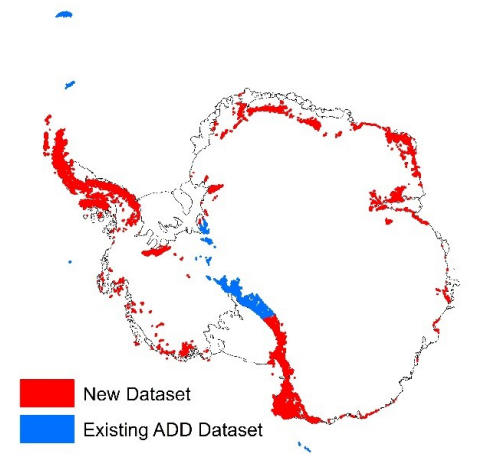 Will your new Antarctica rock outcrop dataset be publicly available? Yes. The paper is currently in review and the dataset will be available as supplementary material, and will also be available to download freely from the Antarctic Digital Database. This entry is filed under Carbon and Climate, Data, News.